At one time or another, all of us have experienced the pain of being separated from a loved one. It can be a physical or relational separation and it can be long or short term. Sometimes, sadly, the separation is necessary in order to protect ourselves or our loved ones from an abusive or dangerous situation. No matter the cause, separation is painful and difficult to endure. The divisions among Christians, while they hurt the Church, they wound Christ. And, divided, we wound Christ. The Church is indeed the body in which Christ is the head. We know well how much Jesus cared that his disciples remain united in his love. You are a powerful intercessor before the Triune God, and you are truly my Mother. You care about every aspect of my life; the walls of separation that hurt me, hurt you, too, because I am your child and you love me. You care also about those from whom I have separated myself because they also are your children. Take this knot into your loving hands and work diligently to untie it. Loosen the snarls of misunderstanding, instability, and conflict. Give me courage and a sincere desire for peace in my life. Then show me the steps I should take to make this peace a reality, that I might experience the gift of true unity with all those you love, and those who love God. Mother, I also want to unite my prayers with those of Pope Francis, asking God to fell the walls of separation and grant lasting peace to the world. Amen. 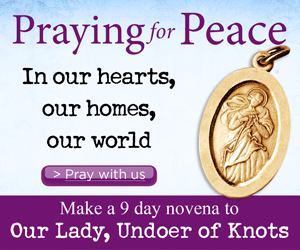 Our Lady, Undoer of Knots Novena. Bookmark. I heard you this morning on 55″ KHZ Relavant Radio, speak to us about this Novena to Our Lady. And I want more!!!! Thank you for the introduction. I was praying for a special intention for someone this morning and I heard you speaking about the Novena to Our Lady, Undoer of Knots, on 550 WSJW Relevant Radio. My immediate thought was, this is my answer to my prayer. I passed this website on to the person for whom I was praying, and I also intend to do this Novena. I heard you this morning on 950 Relevant Radio Chicago. Three close friends and family members are in need of this novena. My dear friend’s dad is undergoing intestinal surgery today. This novena is divine intervention! My sister-in-law and I were going to pray this together prior to this morning’s show. Now, we have countless others joining us!! An answer to prayers. Amen!! Praise God!